Little by little we are dissecting the Bernard Crowe incident. Nailing down who was present has been difficult due to no one being sure that the names given are true names. We do know that Luella in Tex's version is Rosina Kroner. Ed Sanders has proffered some names but with pretty much no sourcing. The court testimony gives us the names Jim, Del and Steve who are associates of Crowe. But who are Jim, Del and Steve? Next are pages of court testimony where Lotsapoppa is discussing Del beginning at the very bottom of the first page. According to the testimony it was Del who set up Lottsapoppa with Rosina, Lottsapoppa had not previously known Rosina. When I first read the testimony I thought to myself that Lottsapoppa was probably saying that Del was dead because he didn't want to involve him any further. Turns out I was wrong. Ziggyosterberg and I kidded around, in the last Crowe post, that Dale Fimple in Sanders narrative did not sound like a real person. Turns out Sanders was right this time! What's in this article is essentially what Crowe stated in his testimony, down to the girl named Chris who Crowe says was in the accident where "Del" was killed. 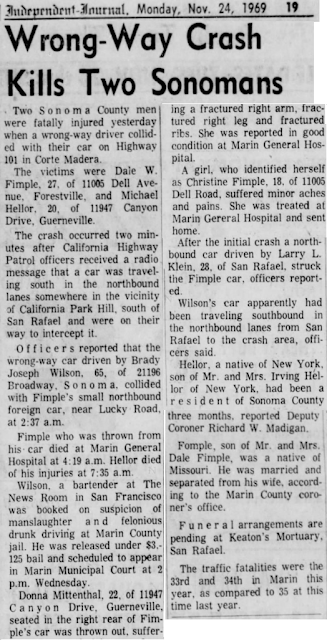 I do not believe that Chris was Fimple's wife even though she gave her last name as Fimple to the hospital. A little more on Dale Fimple. 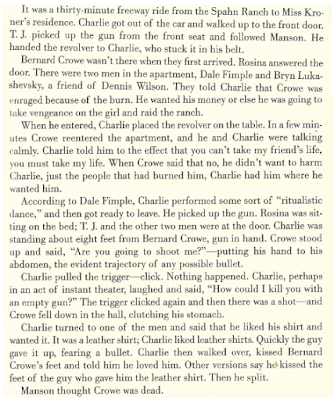 Where Sanders got the information about what Dale said about Charlie's "ritualistic dance" and the description of how the shooting went down is anybody's guess. 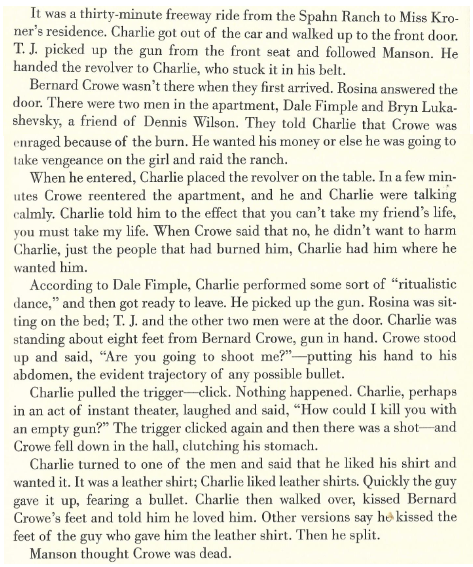 Dale was dead at by November 23rd 1969, before the public learned that Charlie was involved. He could not have learned it from Dale directly. You may have noticed the last name of Scorpi in the above testimony, it's mentioned twice. I was a bit mystified until Dreath pointed me to the page in the testimony where that last name was connected to a first name. Steve apparently is Steve Scorpi. Unfortunately I have not been able to find anyone named Steve Scorpi. When searching for simply the last name Scorpi at Ancestry there are a meager 20 hits in the entire US including men and women and none are young enough to be our guy. I am leaning towards Scorpi being misspelled by the court reporter as Crowe himself did not know how the name was spelled. I believe that Crowe was probably saying Dale in his testimony but the court reporter mis-heard him, maybe due to Crowe's manner of speaking. Dale and Del sound very much alike when spoken.